Japan LNG imports fell 0.93% YoY in 2018 as it purchased 82.85 MMT of the chilled fuel, the lowest since 2011. 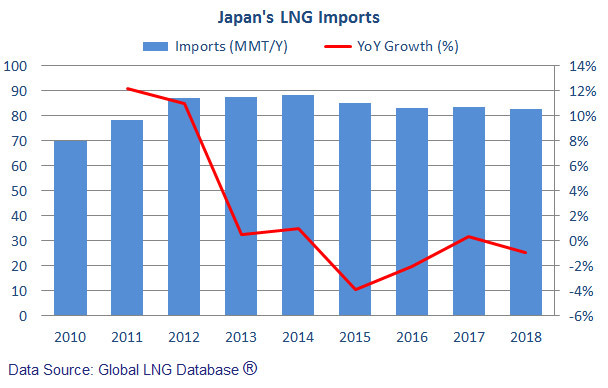 Japan's LNG imports fell 0.93% YoY in 2018 as it purchased 82.85 MMT of the chilled fuel, the lowest since 2011, while its oil and coal imports also dropped, reflecting the country's declining population and slow economic growth, according to the country's ministry of finance report. The figures also underscore improved energy efficiency, and the emergence of alternative fuels for power generation and in transport, while a rise in nuclear power output last year in the world's biggest importer of LNG further reduced fossil fuel imports, Reuters reported.